I have these jeans. ‘Boyfriend’ jeans. Although, to be honest, the Poolboy has been my boyfriend for 45 years and these sure ain’t his jeans. But I love them and since I am way-far from being a fashionista, that’s saying something. They don’t fit me particularly well. In fact, the thighs are a bit baggy. But the waist is comfy, the length is good, allowing a generous double cuff. Very hip and happening (although that phrase probably is not!) with my retro Keds. They are just the perfect comfortable pair of jeans for my lumpy, bumpy body. No flair. Little style. But comfort out the YaZoo. Slowly, ever so slowly, the fabric has started to wear. Just above the knee the blue fabric has faded almost to white, and strings of fabric are close to fraying, showing skin just ever so slightly. They look pretty much like the ones on sale in upscale stores right this very minute. Worn. Used. Comfortable. The fraying ain’t just above the knee. It is also beginning – although not quite there yet – to fray where my more-than-ample thighs rub together. Oh yes. They are close to showing an area of my body that should not be seen by the public-at-large. At all. This kind of fray-ness is not for sale in any stores. Oh no. Fashionistas are not looking for this. It was not seen on any runway at NY Fashion Week. Sometimes I feel like there is a fraying of my own edges, that strings that hold me together need repairing, to be rewoven into a tighter knit of protective ware. [pullquote width=”300″ float=”left”]Sometimes I feel like there is a fraying of my own edges, that strings that hold me together need repairing, to be rewoven into a tighter knit of protective ware. [/pullquote]Some fraying is not so acceptable. As with my thigh-frays, some fraying loosens up and exposes nasties. We’ve all got ’em. Many are woven into our personalities, the ones that others love or leave, the ones that break or build friendships. But others are like thorns in our sides. They need to go, but we are too often unaware that they exist, that they underline many of our problems, too much of our pain. I think God does us a huge kindness by not forcing us to see all of them at the same time. But he does pull at our frays. He does want us to notice them. At some point. For me, one of those loose strings frayed apart recently in a big way. Here’s the nutshell overview. A couple family members are choosing a path that I do not agree with. Their path seems hateful and mean to me and is in direct opposition to the path I have chosen. I totally understand their reasoning. I do. I just think my reaction should be theirs. It is not. I doubt their actions will change. But mine is the one they should choose. Mine is the right way, the only way. Thus, I am angry at them. Righteous indignation, with my black judge’s robe draped dramatically around my shoulders, gavel in hand. But I didn’t know it was this insatiable need for control that drove me to such anger and frustration. I thought it was because I was right, dammit, and they were wrong. In tears, I noticed. I always cry when I realize that a change is needed, partly out of pain, and partly out of being pridefully mad that I didn’t get it before (mostly the latter). I don’t want it to be this way. I don’t want to lose. I want to be right. And maybe I am in the long run, but I have to release being the one who gets to judge, to control the decision about others’ actions – or non-actions. I have to change me. Not them. The black robe needs to come off. I need to step down from the bench and permanently drop the gavel into the kitchen drawer to use only to tenderize the next slab of meat. I can have opinions. I can shout them from the rooftops. But an opinion and a judgment are two very different animals. 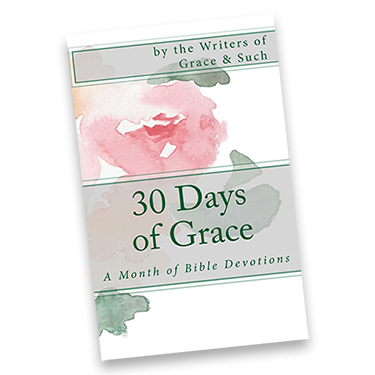 One stands upright and gives it voice; the other steps down after the shouting and slithers on its belly (fully robed), wreaking havoc and discord and anger. I need a total rework of my thinking process about this. Change isn’t always about fraying and losing and ending up with less. Sometimes it forces growth, expansive and oxygenating. 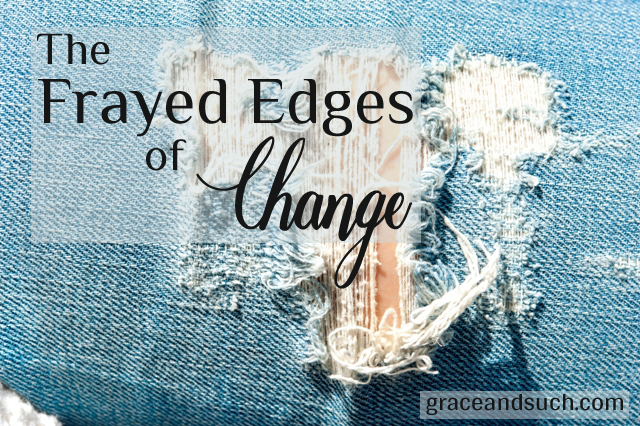 Accepting change can loosen the taut, fraying strings of your life, letting God help you patch up the hole, and move on. It can bring a new, fresh freedom. I know there will be more fraying. God is far, really far, from being done with this girl. But, for now, the control freak rests, the fraying slows. As for my fave jeans, they, too, are close to resting, close to being done. Easier to recover from than my bruised ego (and much less painful than finding a bathing suit), I am off in search of the perfect replacement pair. How about you? What fraying do you have in your life that needs attention, maybe repair or patching? God pulls on our frayed ends to get you to notice what needs attention. Are you noticing? Sometimes I feel like there is so much fraying that I can’t decide which string I need to focus on the most. Thanks for making me think about paying closer attention. Thanks for this honest, oh-so-relatable post. I appreciate that I’m not the only crier when it comes to change, and that I can only change myself. Taking off the robe. Ok this nailed me! Yep right between the eyeballs! thank you for your honesty!!! And thank you for a fresh look at my own control issues!!! Prayers for you! Oh, that whole feeling frayed thing has taken on new meaning. Thank you for that! As I’ve read these posts this last month, I keep wondering when my little sister (Jen) became so wise and where she finds these incredible women and writers! Thank you all. Ouch! Meddling like the preacher does on Sunday morning! Thank you for the honesty & making me think! From another black robe wearer.